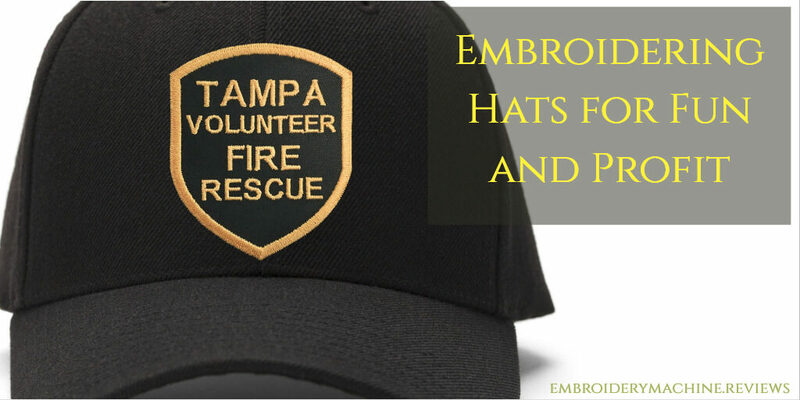 An embroidered hat, shirt, or baseball cap can make a great gift. Many companies offer customized baseball caps as promotional items, and they’re a fun, stylish way to commemorate a special occasion. The right hat can also be an excellent addition to the uniform of a sports team, band, or hobby group. In this article we’ll tell you how NOT to embroider a hat, show you the RIGHT way, and tell you how to choose a machine that will make these tricky jobs easy. Note that most of what we say goes for shirts too, but in this article we’ll mostly focus on hats and caps. But first, here’s our top 5 picks for people in a hurry. We have selected machines across the price range. So, whether you want to embroider just one hat every now and then, or become a budding entrepreneur, there’s a machine to fit your needs. The Brother PE770 is a versatile computerized embroidery-only machine which, in our opinion, is good value for money for anyone starting new to embroidery, including embroidering hats. The Brother has 136 built-in designs and 6 different fonts. There is a USB port which can be used to import your own designs. It does not come with a dedicated hat hoop, but these are available from third party suppliers. That being said, the large flat hoop included is still able to do the job. The reasonably sized LCD screen allows you to edit your designs on the machine, including size, mirror imaging, and rotating. It has automatic thread tension and an automatic thread cutter. While it has the capability of 650 stitches per minute, the fact you can slow the stitching down ensures you don’t stitch onto the peak of the cap. Affordable machine for home hat embroidery. This combo embroidery and sewing machine from Singer is sleek and reliable. It has 125 built-in designs and 5 different lettering fonts. The needle threads automatically with Singer’s Swift n Smart Threading feature. It also has a drop and sew bobbin feature to make life easier. This machine links to your computer so you can search on the internet and use any compatible design you find. The Futura has a large embroidery hoop sized 10” by 6”, but by using the built-in software this can be increased to 20” by 12”. The only setback is that this machine does not have an automatic thread tension, but provided you keep a close eye on your work this is not a deal breaker. Extensive built-in designs and capability to import more. This offering from Brother has some outstanding features. It is a combination sewing and embroidery machine offering users 240 built-in sewing stitches and 138 built-in embroidery designs. It also has 11 different lettering fonts. So, whether you want full embroidery or custom stitching on your hat, the choice becomes yours. Couple these features with a large color LCD touch screen and the ability to import further designs from a USB port, and the creative world is at your fingertips. You can even design your own stitches with the My Custom Stitch function. The LCD touch screen lets you rotate, mirror, and reposition your design, and will also give you on-screen help should you need it. Other features include an automatic needle threader and a top drop bobbin. The function panel is conveniently located allowing ease of access to the start/stop button, needle up and down button, and automatic thread trimming. Thread tension is adjustable on this machine. The additional grand slam package offered with this machine includes a cap hoop, 5,000 additional designs, as well as other sewing sundries. Versatility of being a sewing and embroidery machine. 138 built-in designs and the option to import more. Grand Slam bundle includes cap hoop. Grand Slam Embroidery Package Included!!!! One of the newer producers of quality sewing and embroidery machines is Janome. This combo embroidery and sewing machine is easy to use despite its myriad features. The large 4.7” backlit LCD touchscreen is easy to read and use. The onscreen buttons are clear and help avoid confusion. You can easily choose your stitch, set the length and width, and then the machine automatically selects the tension for you. It has 90 built-in embroidery designs and 98 different sewing stitches, as well as 3 different fonts and 3 monogram designs. You can also import designs from a compact flash memory card. The LCD screen allows you to customize your designs by combining more than one design, adding lettering in lower- or upper-case, or by changing fonts. It has an automatic needle threading function and a drop in bobbin. It has a 7 feed box system which allows it to ably deal with both flimsy and heavy-duty fabrics. Two embroidery hoops are included, the larger giving up to 5.5” by 7.9” of embroidery area. This is particularly useful for hat embroidery. The outstanding feature on this machine is the automated thread tension which allows for consistent stitching on your designs. Easily deals with heavy and lightweight fabrics. Extended Warranty and Free Shipping! The Janome MB-4S the most expensive of our five picks but is worth including despite the high price tag. It falls between being a home-use embroidery machine and one intended for commercial use. Having four needles means you can set one project running and move on to another one while the machine completes the work. The large embroidery area is 9.4” by 9.7” and can be used with the four hoops supplied, or six industry-standard hoops. Computer connectivity lets you to import designs via a USB port. The machine has 3 MB of memory which lets you store up to 100 designs or 1.5 million stitches. It has 50 built-in fonts and 10 monogram settings. The remote computer screen permits complete editing and set-up control. At 5 inches the screen is clear and easy to see. Other notable features include an LED light, a dedicated bobbin winder which works even when the machine is stitching, and an automatic thread cutter. Its 4-needle design gives the capability of fewer thread changes and is the first of its kind for home use. If you were thinking of starting your own small business embroidering hats and or any other items for sale, this machine would be a good investment. It can deal with just about any embroidery task or fabric you might throw at it. 50 built-in fonts and 10 monogram feature. USB port and computer connectivity. Storage for 100 designs or 1,500,000 stitches on a 3 MB internal memory. 4-needle design for speedier work and fewer thread changes. Capable of stitching using up to 10 different hoops. Larger and heavier than other embroidery machines. Might not be easy to use initially. LED Light: The LED Light offers precise lighting for outstanding results. When you are planning to embroider hats your main consideration will be the capability of the machine to complete the task easily, efficiently, and to a high standard. The Brother SE1900 Sewing and Embroidery Machine is capable of all these functions. The price point is in the middle range when it comes to machines of this type, and it has the advantage of being a very good sewing machine as well. This means you can not only embroider your hats, you can add some decorative stitching from the 240 included, or stitches which you’ve customized yourself. Design options are endless. The additional grand slam package, which is included in the price on Amazon, provides your hat hoop and much more. This versatile machine will complete your hat embroidery and so much more with ease. The runner up would be the Brother PE770 5×7. This is an embroidery only machine, and cannot be used for sewing. The PE770 has a larger than average working area, with a backlit display. This is great for people working on large projects, doing a high volume of work, or who just like the feel of having plenty of space in a machine. The display isn’t the brightest, but it doesn’t present any problems in terms of being able to see your working, even when using darker fabrics. With 136 built-in designs, six fonts, and USB compatibility, the possibilities with the PE770 are virtually endless. Whether you’ve created your own unique design in a program like MS Paint, or have found an image on the internet that you love, you can easily transfer your own designs between your computer and this machine. There are even USB drives designed to resemble sewing machines, such as the Vintage Sewing Machine USB for PC and Mac from Sew Pro. Cute and unusual, and you’ll never forget which flash drive has your embroidery files on it again! The PE770 has a built-in memory for easy access to your favorite designs. It also features additional editing options, which are exclusive to this model. The one downside is that it cannot handle full fabric embroidery, but this is an option that would require a genuinely professional machine. Read our full review of the PE770 here. Being able to rely on a company’s reputation can be a good starting point. You’ll want to make sure that the machine you choose has been tried and tested when it comes to embroidering hats. Leaders in the industry include Brother, Singer, and the newcomer to the market, Janome. Ease-of-use is another consideration. You don’t want to spend hours trying to set your machine up for your project. With that in mind, make sure you choose a machine which changes your threads easily. A major feature you will need to identify is the ability of the hoop and work area to cope with hat embroidery. Some machines come with a designated hat hoop, or these can be purchased separately. However, this extra hoop is not always needed and the machine’s standard hoops can sometimes deal with the task just as well. This useful YouTube tutorial demonstrates how to hoop a hat ready to embroider. Embroidering hats is all about the design. You will need a machine which can either import designs or attach to your computer to allow you the freedom to create your own personalization. Having an LCD display on the machine or the ability to connect to a computer for design is really a must-have feature. You can reposition and tweak your design to ensure the finished result is exactly what you want. Professional hat embroidery machines have in excess of ten needles. This enables them to work on a large scale, setting the design and then leaving the machine to is work. Hat embroidery can still be achieved with a single needle, but it will require some time commitment from you to change the thread colors. One of the machines we will look at, the Janome MB4S, has four needles and might save you some time. Familiarizing yourself with the machine’s capabilities by watching videos and reading the instruction manual before starting could save you time in the long run. It will also make sure you’re clear about what you need to do from the get go. Learn how to place the hat in the hoop and import and center the design. Automatic thread tension will ensure your design remains consistent with less puckering and thread breaks. Running your machine too fast. This hobby of ours is an art form. It involves delicate, detailed work, and patience. Your unit shouldn’t be running at more than 750spm (stitches per minute) for flatwork embroidery, such as t-shirts, and you should slow it down even further for curved surfaces, such as pre-made hats. Hooping gone wrong. A hat should sit straight and center, securely in its hooping frame. Yes, some designs look better slightly off center, but getting this right takes years of patient learning and experience. For now, stick with a strong, centered design for a quality result. Lack of tension adjustment. The correct thread tension will produce neat, tight stitches and a seamless end result. Check your thread tension, adjust if necessary. Bobbin. The bobbin on your machine is like the seatbelt in your car. You wouldn’t drive off without checking your seatbelt, would you? In the same fashion, don’t start a project without checking your bobbin. Not changing needles often enough. Yes, changing needles is a chore, but it’s one that will save you time down the line. As soon as you notice that the timing is off, or a needle is damaged – replace it. Placement. When you are embroidering a pre-made baseball cap, you MUST leave at least half an inch clear from the bill of the cap. Catch the cap bill in your needle, and you might just be catching a bill for a whole new machine. Not digitizing appropriately. Make sure you digitize your files for the product you intend to embroider. A design digitized for a flat surface such as a t-shirt won’t work on the curved surface of a pre-made baseball cap. The Cap Hat Hoop Package is worth a look if you are keen to start embroidering hats. Not only does it come with some samplers of colored threads and a free sock hoop, it also includes some very sturdy, good quality sewing scissors – it may well be worth purchasing for these alone! As they are intended as samplers, the threads included are not standard quality, and break quite easily. The cap hat hoop fits a variety of models, including most of the leading brands, such as Brother, Singer, Janome and Eversewn. It is, however, worth checking that yours is definitely compatible before you purchase. You will also need to purchase an adhesive stabilizer separately to use the cap hat hoop with an embroidery machine. When you are using the cap hat hoop, the hoop on your machine needs to be larger than 5.25” x 4.5”. In her concise yet comprehensive YouTube tutorial, embroiderer Sarah Cone talks you through the stages of embroidering a hat on the Brother PE770 5×7. The hat clamp she uses can be purchased from the Hiddensafes Etsy store. The baseball cap you intend to embroider. Your 5×7 hoop (if using the Brother PE770). A hat clamp that fits your hoop (the clamp shown in the video was purchased from Hiddensafes, on Etsy. They can be made in a range of sizes to fit most standard hoops). Remove and set aside the insert from your machine’s hoop. Place your self-adhesive stabilizer inside the hoop. Ensure the sticky surface is facing you, but do not peel off the protective covering just yet. Fit your hat clamp inside your hoop, on top of the self-adhesive stabilizer. Peel off the protective covering from your stabilizer to reveal the self-adhesive surface. Loosen the wing nut screws at the base of your hat clamp. This allows you to fit the bill of the hat under the board at the base of your hat clamp. Place your hat inside the hat clamp, with the bill secured under the screwed-on base. Tighten the wing nut screws as tight as they will go. This ensures the cap is held securely while stitching is in progress. Undo the clasp at the back of the cap, and flatten the cap down as far as you can onto the adhesive stabilizer. Remember, the product featured in this video is the Brother PE770 (see our review below). Load your hoop set up onto your machine. Using the touch screen display controls, check the layout of your design, and make any necessary adjustments. Still using the touch screen display controls, select the area you want to embroider. On your display screen, check where the bottom of your design will be, and ensure you are within the maximum 4”x4” hoop area. Make sure the wing nuts on your hat clamp are as tight as possible, and that the cap is pressed firmly to the adhesive stabilizer. This will keep your hat stable during the process without the need for pins. Start your embroidery! If you have a pre-set design you are using, select this now, or load a new design. Once your embroidery machine has completed your design, remove the hat clamp. Unscrew the wing nut screws on your hat clamp. Pull the cap away from the adhesive stabilizer. Check the reverse of your cap design area. If the cap was securely fixed to the adhesive stabilizer, and the wingnuts on the clamp were sufficiently tight, the reverse stitching should be neat and smooth. You may sometimes have reverse stitching “catches”, where the needle has got slightly too close to the cap bill. This does not normally impact the quality of the design. You can use text and images in your designs. If you are doing a design that uses the full area (4”x4”), it is advised to adjust it just slightly back from the edges of the hoop area, to ensure a smooth finish.